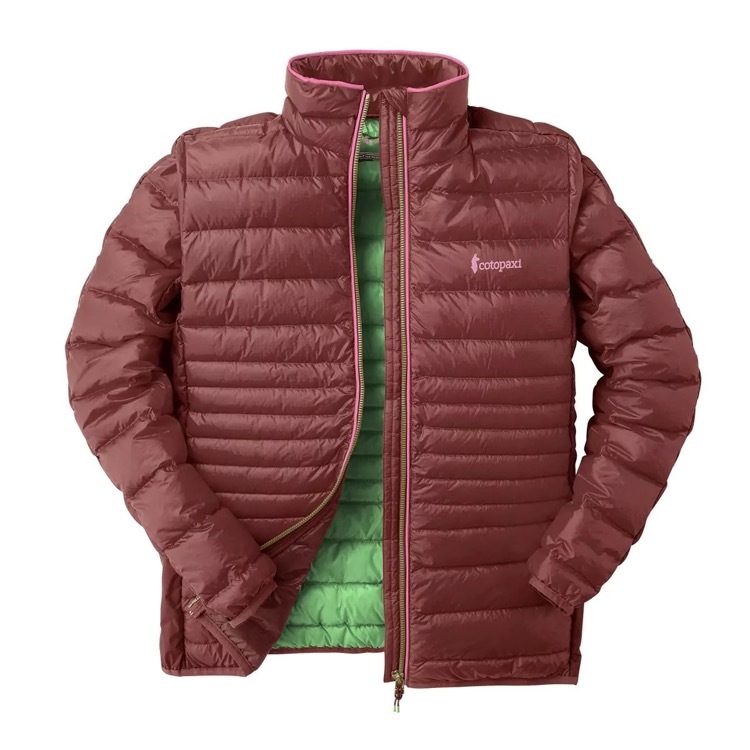 Basic summary: A lighter weight version of Cotopaxi’s popular Fuego down jacket, the Fuego LT combines natural goose down with synthetic insulation, plus solid exterior wind and water resistance. The resulting packable jacket can be a midlayer for harsh winter conditions, an outerlayer for aerobic activity, or a casual do-everything piece for all seasons. We’re fully aware that it’s getting hard to tell all of these puffy jackets apart – and any newcomer to the space needs to have something distinctive or compelling to make it stand out from the crowd. 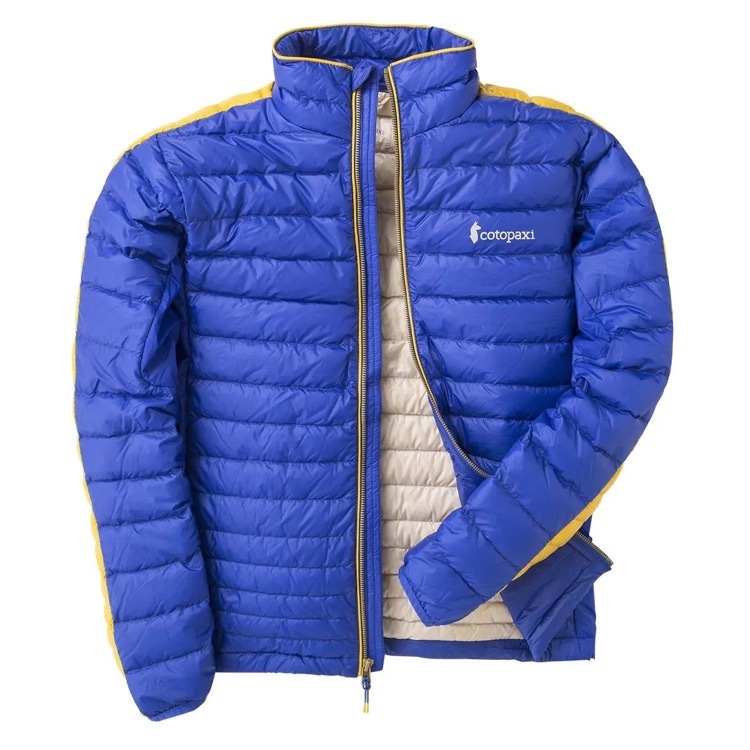 The Cotopaxi Fuego LT is a jacket that earns a spot among the longstanding players in this category – think Patagonia Nano Puff or The North Face Thermoball – and distinguishes itself in a couple of key areas in terms of construction and performance. Most notable is the use of natural goose down in the Fuego LT alongside synthetic insulation, with natural down fill in the main torso panels, and Polartec Alpha synthetic material on the side panels. The insulating capacity of the down panels is very impressive; the 950-fill rating exceeds that of most 3-season sleeping bags. The lightweight Polartec side panels have excellent breathability to dump heat during high aerobic activity, with a comfortable brushed interior fabric surface, and a more rugged open-weave exterior. The Polartec panels draw moisture away from the body quite quickly like a wicking fabric, and have a bit of stretch component to move with your body during activity. Goose down is also remarkably lightweight – it has a higher warmth to weight ratio than virtually any synthetic fiber – and the thin side panels of the Fuego LT help reduce weight even further to provide excellent warmth while minimizing excess weight. For point of comparison, the men’s jackets mentioned above weigh in at 337g (Nano Puff) and 350g (Thermoball), while the Fuego LT is more than 15% lighter at 283g. And the 20D ripstop exterior rating is equivalent to both of the rival models, so you’re not sacrificing wind resistance with the decreased weight. The torso fit of the Fuego LT is trim, and much closer to the body than Cotopaxi’s standard Fuego jacket. The cut is roomy enough to wear over a long sleeve shirt and provide full range of motion, but sleek enough to be worn under a hard rain shell in extreme conditions. Exterior DWR repellent is effective at keeping light moisture away, which is especially important, as natural down loses its ability to insulate if it gets saturated. Another drawback of down is its tendency to clump, so the panels of the Fuego LT are sewn narrower on the bottom half of the jacket than they are on top, to prevent “downward” migration. We haven’t experienced unusual distribution of the natural fill in our testing, which includes about a hundred repetitions of compressing it down for storage and then unpacking it for use. One oddity about compressing the Fuego LT is that it doesn’t entirely secure into one of its own pockets; instead, Cotopaxi provides a small stuff sack for complete and secure compression. 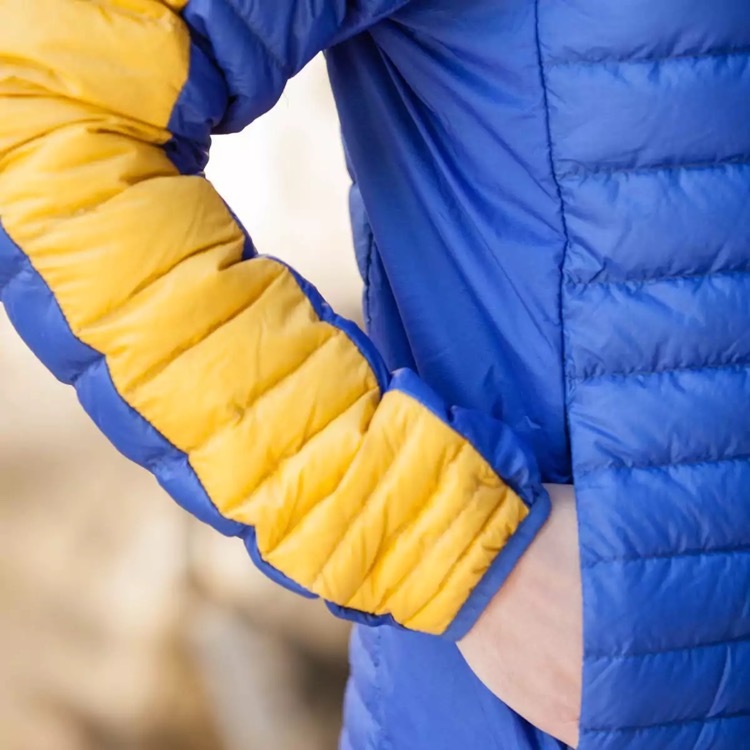 We honestly never use the stuff sack, and instead just cram the jacket into one of the hand pockets – it’s much more convenient this way, and you can secure about 95% of the jacket into the pocket with just a tiny remainder sticking out. It seems like an easy fix on future versions of the Fuego LT to give one of the hand pockets a double-sided zipper for complete closure. We had another zipper issue with the main torso closure, which has a frustrating tendency to get stuck in its own housing if you zip it up or down mindlessly. Aside from that, the accent elements are thoughtful, with soft elastic bindings at the cuffs and hem, and super-roomy interior pouches to stash extra cargo if you’re not wearing a pack. Collar height is a pleasant midrange that can insulate your neck well in frigid temps, but doesn’t irritate your chin or jaw when fully upright. 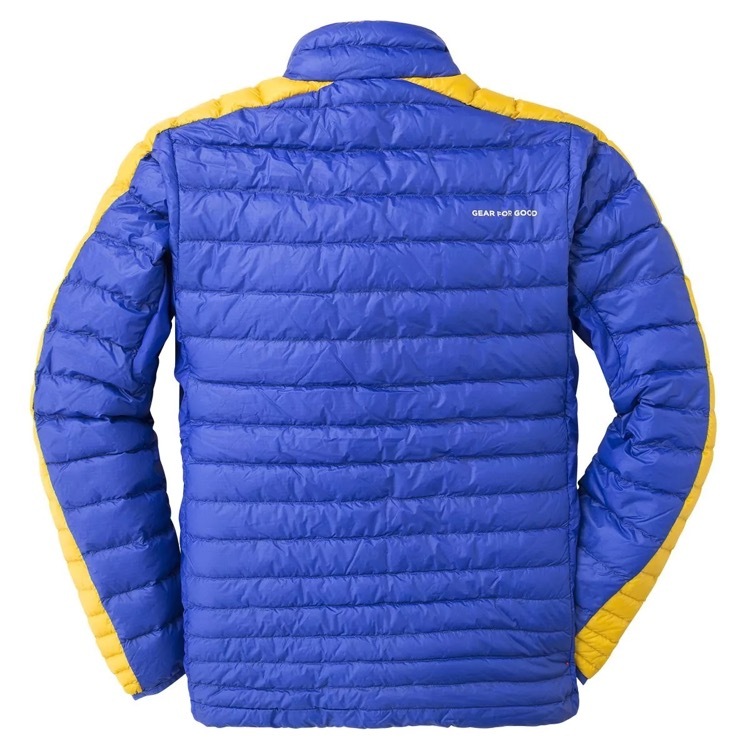 For multi-purpose use in a wide variety of conditions (except for steady rainfall), the Cotopaxi Fuego LT is a pleasant and interesting addition to the puffy club. 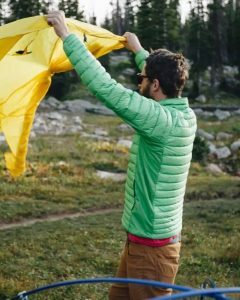 It is available now in both men’s and women’s styles at www.cotopaxi.com.